SoundTaxi Pro+VideoRip is an easy to use video or audio file converter. With this wonderful converter one can convert any video or audio files at lightening speed. With just a few mouse clicks you can enjoy all your protected songs on iPod, any other MP3 player, MPEG4, or DivX player, CD player, mobile phone or PC – without any restrictions or DRM protection. SoundTaxi Pro+Video Rip is extremly fast and easy to install and use even for newbies. 🙂 Additionally, SoundTaxi lets you rip audio from videos converting MP4 to MP3, WMA, AAC etc. How to Enter Giveaway Contest? 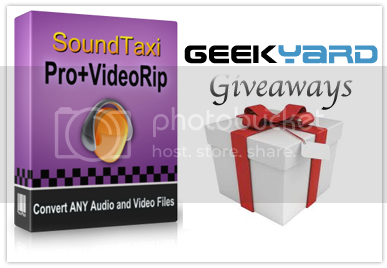 We would like to thank SoundTaxi for providing 10 license keys of SoundTaxi Pro+VideoRip (Price $39.99) for Geekyard readers. Just share this post on Facebook/Google Plus/Twitter and add the shared link in the comment section of this post to enter the contest. This contest ends on 30th October, 2012. Thanks Praveen for giveaway, please count me in. your site is updating with tech, every day. I received the license key, thank you so much. Thank you Praveen and SoundTaxi, I received my license this morning.